Trash To Treasure: From Toilets To Tiles : The Picture Show You wouldn't expect a landfill to be a place where you could turn something into a thing of beauty. 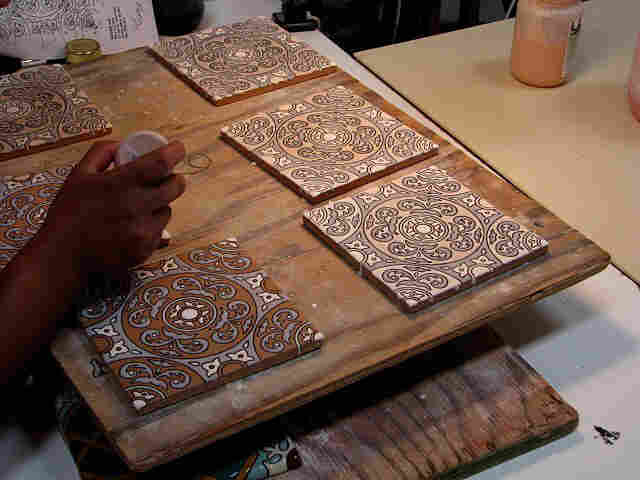 But decorative tile maker, Paul Burns, sees opportunity in trash. You wouldn't expect a landfill to be a place where you could turn something (with a high yuck factor) into a thing of beauty. But decorative tile maker Paul Burns saw an opportunity. He's taking discarded porcelain toilets and using them to make tile. 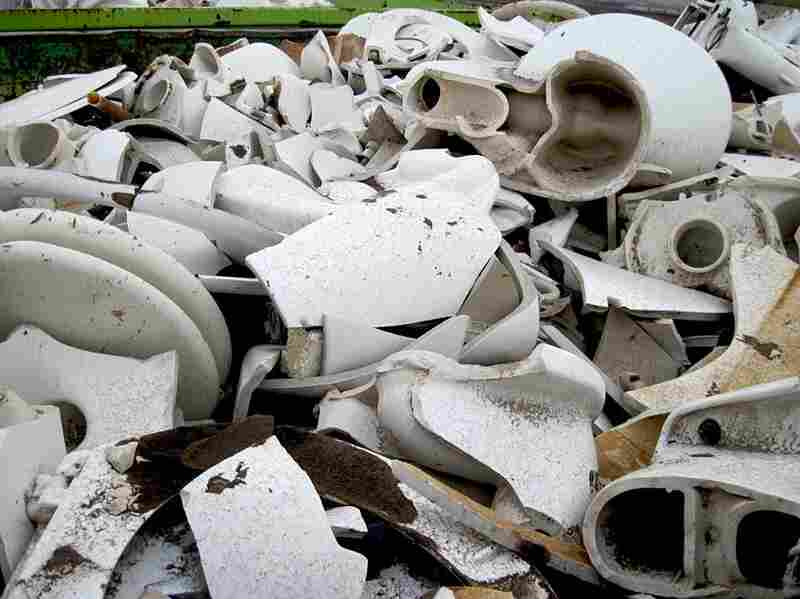 Although the cost of recycling toilets is about the same as buying new clay, Burns likes the challenge it involves. 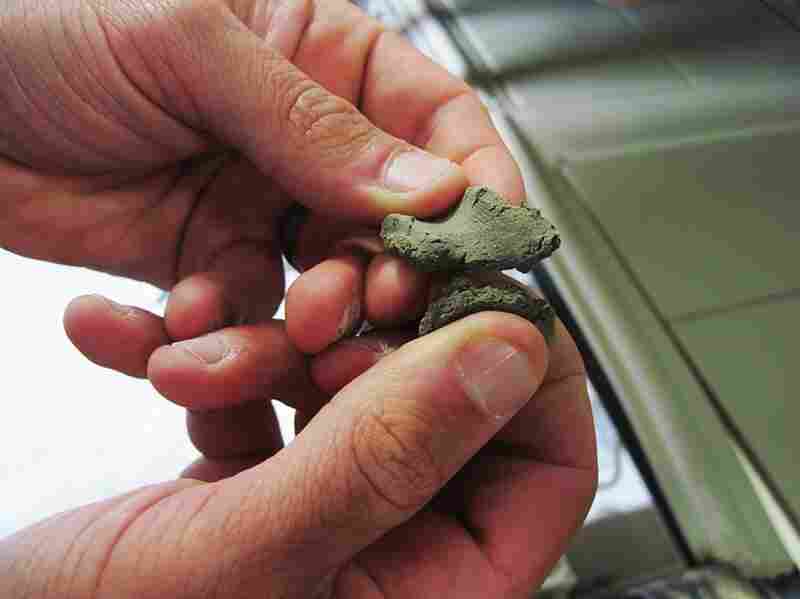 The waste is crushed to a sandy consistency and mixed to form clay. 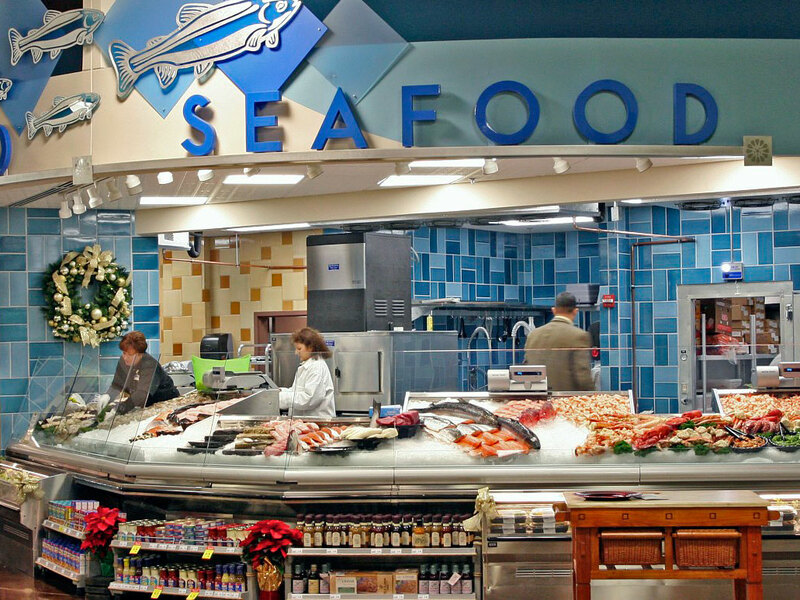 The finished tiles are used in buildings all over the world — such as the Atlanta Botanical Gardens and the Whole Foods in Huntington Beach, Calif. The "Debris Series" features more than 112 glaze colors and contains more than 60% recycled materials. This isn't the first time Burns realized he could use waste materials in his clay mixture. 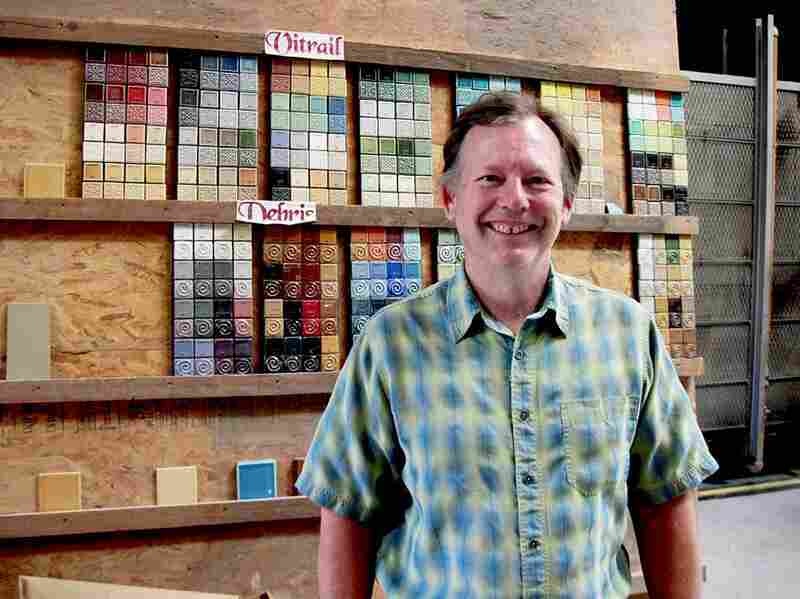 He's the owner of FireClay Tile in Northern California and a self-described scavenger. Burns' tile factory is next door to one of the oldest granite rock quarries in California. And when you quarry rock, you create a lot of dust, which isn't easy to dispose. The company searched for decades to find uses for its granite dust. "So they came over one day to see if we could make a product out of some of their dust," Burns says. He had already been experimenting with waste materials without success. He thought, why not? It worked, although it took him almost two years to figure out how much of the dust he could add into his clay and still maintain consistency. 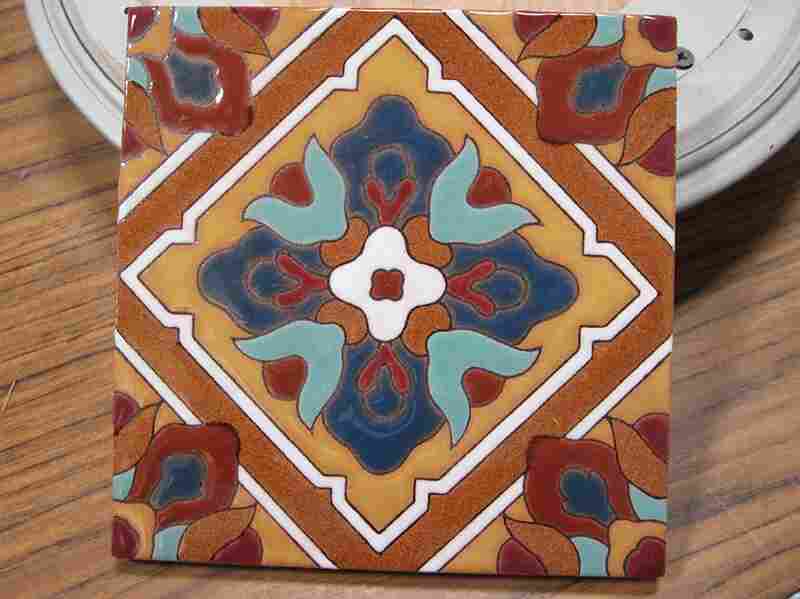 Handpainting of Cuerda Seca Decorative Tiles on "Debris Series" recycled tile, San Jose, Calif. 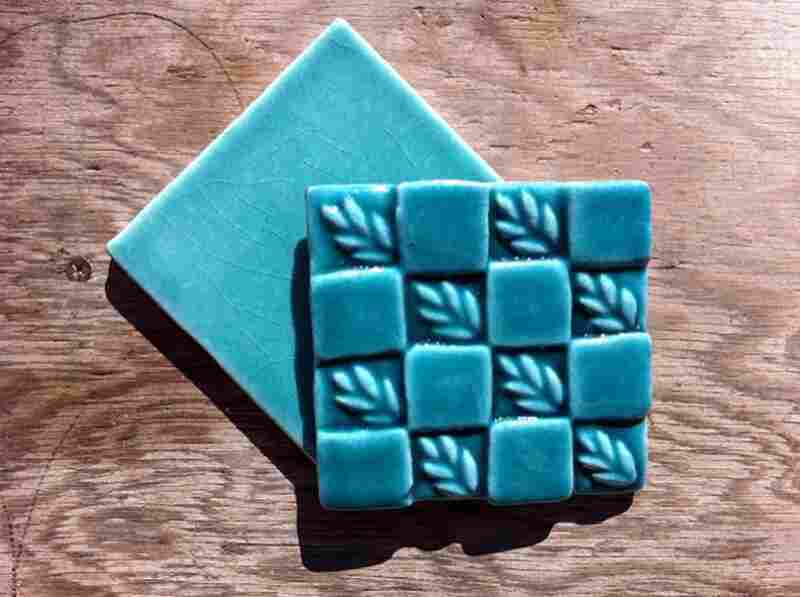 He created a new tile line called "Debris Series." And then he added other post-consumer waste products like recycled glass. He also found he could use the sludge from sandblasting water pipes, called spent abrasives. All of this went into his new clay brew. The latest innovation: toilets -- porcelain toilets -- that have been thrown away (or used as road base). Surprisingly, it wasn't easy to track down the toilets at first. But Burns hit the jackpot when he heard from Michael Gross, the aptly named marketing manager of the Zanker Road Landfill near San Jose, Calif.
"Debris Series" recycled tile in United Supermarkets, Dallas. Gross realized the significance of Burns' endeavor -- his major goal being to find more local markets for his garbage. "Right now all our plastic containers [and] metals are going to Asian markets, which is ridiculous," Gross says. It took his team about a year to pluck all the toilets for Burns (along with some sinks and tubs), one by one, out of construction waste piles. 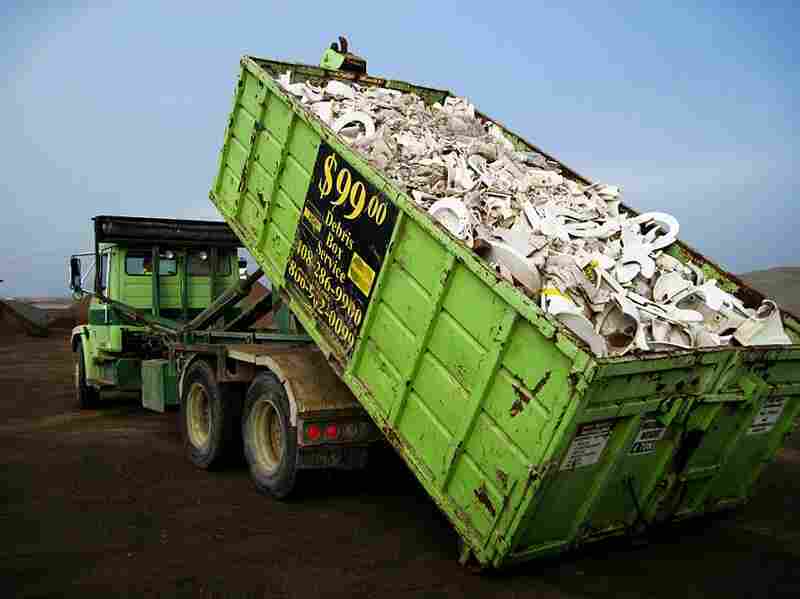 In November, they had enough collected -- about a dozen metals containers filled with 150 tons of porcelain potties. Within a few hours, the landfill crushed them all into a sandy consistency for Burns. He's paying $50 a ton for this porcelain -- about the same as new clay. So why does he do it? Mostly, he likes the challenge: "I always like using things for best use. When I see things around me that are thrown away, I look at them and try to find a use for them." But sometimes, Burns says, "working with waste is a big waste of time." Burns, though, knows how to be efficient -- and knows when to say no. The Budweiser brewery made him an offer, for example. "They wanted to know if I could get rid of their yeast cakes that are left over from brewing beer. They sent me a 5 gallon bucket. I opened it and the smell literally knocked me down. I ended up with my head on the pavement, and I realized there's no way we can handle this in the factory." Still, one man's trash is another man's treasure. Burns is always on the lookout for the next pile of promising waste.